It’s a feeling that led Ongarato and fellow Golden Hawk Taylor Aitken, a fourth-year psychology student, to form the Community Outreach Council (COC), a new campus council for first-year students at Laurier’s Waterloo campus. Laurier has a rich repertoire of first-year leadership opportunities, with interests such as diversity, sustainability, arts and athletics represented. But both Ongarato and Aitken felt that a campus council group devoted to community service, both on and off the Laurier grounds, was missing. As avid volunteers themselves, Ongarato and Aitken wanted to ensure that first-year students would be able to connect with other Golden Hawks who share a passion for giving back to the community. “Community Outreach Council gives first-year students the chance to continue with volunteering and outreach as new members of the Laurier community and the Kitchener-Waterloo community,” said Aitken, who participates in service opportunities courses designated as community service-learning offerings. 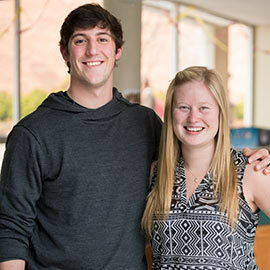 As dons for the COC, Ongarato and Aitken act as advisors to the first-year students, who are responsible for identifying the initiatives and planning the events that the council supports during the academic year. During the fall 2016 term, the COC organized a student fashion show that doubled as a clothing drive. The event resulted in more than 50 large garbage bags of clothing that the COC members sorted and distributed to charitable organizations in Waterloo region. In addition to the clothing drive, the COC wrapped gift boxes for Epilepsy Waterloo Wellington’s holiday gift-wrapping fundraiser, portioned out snacks for the local chapter of Nutrition for Learning, and hosted a hot chocolate social to warm up fellow Golden Hawks as the winter weather descended upon campus. The group plans on coordinating events to support the Special Olympics and Habitat for Humanity before the winter term ends in early April. A campus event to support students during the final exam period is also in the works. Ongarato and Aitken have observed the COC students developing their leadership skills through their involvement with the council. Their first-year counterparts are also building relationships with community organizations – something in which Ongarato and Aitken see long-term value.